The Deshler Cocktail is a WWI-era relative of the Manhattan. I’m not a boxing historian, but I’m told the “Deshler” in question was Dave Deshler, an American lightweight boxer in the early years of the 20th century. I know nothing of his boxing, but it seems he was good enough to inspire a well-constructed cocktail, I suppose as homage to one of his victories. This is clearly a member of the Jerry Thomas-era Manhattan family. 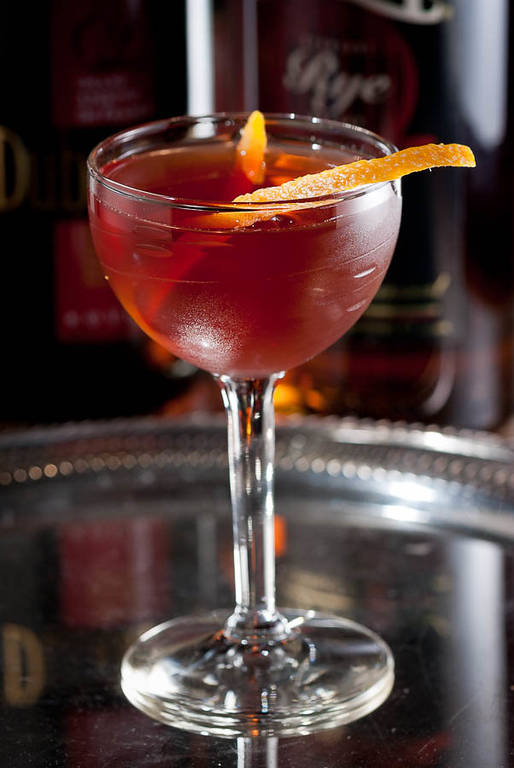 Robert Hess presents a modernized version of the Deshler, one that parallels changes in the Manhattan itself, in his Essential Bartender’s Guide (2008). Though still a small drink, Hess’s version is a little bit larger than Duffy’s, and heavier on the whiskey proportion. Stir with ice, strain into a cocktail glass. Express and garnish with orange. This is the version you’ll usually encounter, and it is a fine improvement—clearly a whiskey drink, not as dominated by the Dubonnet. 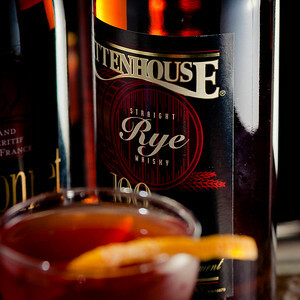 High-proof ryes like the Rittenhouse and Wild Turkey 101 stand up well to the Dubonnet; with standard 80-proof ryes, I’m inclined to up the proportion of whiskey to 2:1. But it’s still too sweet for my taste. The twists of lemon and orange in the mix indicate that this is meant to be a fruit-forward drink; Duffy’s recommendation to shake the mix—sort of a self-muddling operation—cements the idea. But Duffy’s reluctance to provide more than 2 dashes of Cointreau signals that he, too, may have been worried about sweetness. Cointreau is a pretty aggressive ingredient, both in its “orangeness,” and its sweetness. My preference is to limit Cointreau to about a bar spoon (roughly an eighth of an ounce, or 4 ml). That restrains the sweetness and encourages the fresh fruit oils to come forward in the drink. If you’re looking for other cocktails that use Dubonnet to advantage, you might check Arnaud’s Special Cocktail. It has a similar structure to the Deshler, but is made with Scotch instead of American whiskey. “The Deshler Cocktail” at cold-glass.com : All text and photos Copyright © 2012 Douglas M. Ford. All rights reserved.